Arguably one of the most iconic television programs in the United Kingdom’s history, “Doctor Who” has had a large following among the general viewing audience around the world; however, in the show’s 49-year-long span, only now is the show being recognized and gaining fandom in the United States. American audiences seem to be very selective in regard to British media. Compared to the United States’ influence upon British media, the average American would probably not be able to recall 10 different British entertainment or media franchises when prompted. That is not to say that British media isn’t appreciated, as shown by the large fandom such franchises such as “The Office,” “Whose Line Is It Anyway?” and “Queer as Folk” which were American television series based on British television series, among others. “Doctor Who” is a science fiction television program about a time-traveling, humanoid alien, Time Lord, called the Doctor. The Doctor travels through time and space in a sentient time machine called the TARDIS, which stands for Time and Relative Dimension in Space, which is disguised as a 1960s blue police box, with a companion. The Doctor faces a plethora of foes in his attempts to “cure” the universe, right wrongs and save civilization. “Doctor Who” is the longest-running science fiction television show in the world as well as the most successful in terms of ratings, DVD sales, book sales and iTunes traffic. The series’ 26th season, aired from 2010 to 2011, showed an increasing worldwide fan-following as it topped iTunes’ list of most downloaded television series on Apple’s 2011 year-end list. “Doctor Who” was originally aimed toward general audiences, not any specific audiences. The show came under criticism for its gore and violence, which was commonly found in television programs aimed at adults. By being aimed at any and all audiences, the gore and violence was criticized as being adult-only content not needed in shows aimed at children as well as adults. Due to this, the show’s staff decided to try to aim some content towards younger audiences, creating equally scary and fun enemies which have been around since the 1960s until the latest episodes. The show was attempted to be sold to the United States in the early 1970s through Time-Life’s syndication of select episodes, not knowing that the show would not make much sense out of order, as the show ran in serials which, unlike seasons, are whole stories developed and finished in two to five episodes, and many serials compose one season while in the United States a season would be many episodes making up one major story. This cultural barrier made the American syndication impossible to follow and did not fare too well. This cultural barrier is the reason it’s hard to see some shows and other media that the United Kingdom considers essential parts of British culture to be easily integrated into American culture. Doctor Who has a particular style of writing, comedy and acting that is not found in American science fiction too often. The term “British humor” is a common phrase in the United States, referring to television shows such as “Monty Python’s Flying Circus” or films that could be hit-or-miss with American audiences regarding their comedic style. As opposed to American comedy, sarcasm and self-deprecation are the norm in British humor and emotion is often hidden in such a way that American audiences may think they’re just insensitive. While America prides itself on being the land of the free and love their freedom of speech, real freedom of speech is found in British humor where any subject may be joked about and nothing is taboo, while in America subjects such as September 11, 2001’s attacks or racism are considered too much. British comedy is typically found in most British media, not only comedies; “Doctor Who” is full of comic mischief and the Doctor himself is considered to be the comic relief of the show, always showing a positive attitude and pride in himself when staring at a deadly foe. “Doctor Who” and other programs such as “Monty Python’s Flying Circus” are known for their surreal and absurdist style, another staple of British humor, where there would be a big build-up, such as a whole array of things that could destroy the universe in “Doctor Who” or a long skit with many intricate details in “Monty Python”; the episodes usually culminate with a deus ex machina(a machine from the gods, a plot device made to solve a seemingly unsolvable scenario) or the skit is abandoned altogether without a conclusion, in “Doctor Who” and “Monty Python” respectively. These cultural barriers between the United States and the United Kingdom make it difficult for the very “British” hit shows and movies to make a smooth transition to the American screens. Some studios attempt to make programs in America based off the original British program, such as “Skins” and “Pop Idol” which were remade as “Skins” and “American Idol” respectively, most of these do not see success; “Skins” was cancelled before its first season was finished while the original British “Skins” is now moving to its sixth season. 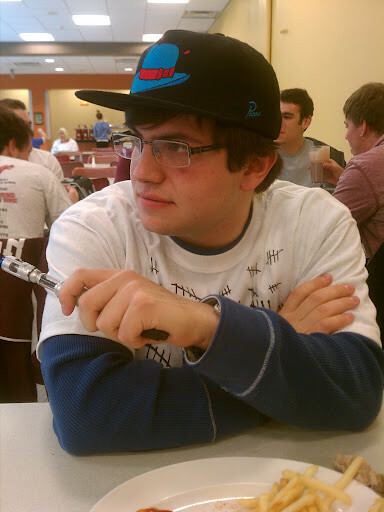 Student with prop Sonic Screwdriver and “Doctor Who” themed shirt and hat. Taken with an HTC Evo by Luis Alicea. “Doctor Who” fandom has been steadily increasing since the reboot in 2005, from being the main attraction at San Diego Comic-Con, an annual fan convention in San Diego held since 1970 for everything from comics and television shows to art and board games, to being the best-selling television show on iTunes in 2011. Whovians, as “Doctor Who” fans call themselves, are becoming a more common sight among the young adult community, with most new fans learning of the show through word of mouth. If kept at this steady rate, “Doctor Who” may reach the status of the Star Wars franchise which it has outsold and probably will outlive, as long as the Whovians demand it as opposed to Star Wars fans begging George Lucas to stop. Marist’s Wi-Fi network is being drowned out in some chokepoints around the campus while continuing to work perfectly in other spots, and the culprit seems to be Microsoft’s Xbox 360. The campus-wide Wi-Fi connection at Marist College, known as AirFox, has had a history of being complicated for students to get online on and, at times, buggy. The latest issue with AirFox comes in the form of weak signal caused by too many Xbox 360s. The popular console can utilize wireless controllers that run in the 2.4GHz band, the same wave frequency in which Wi-Fi signals and cordless phones function. In some dormitories such as Champagnat, which is for freshmen only, the amount of Xbox 360s seems to be so large that the wireless signal given out by the controllers is starting to block the incoming signal from AirFox and students are beginning to notice. “When I bring my laptop to class, or if I’m in the library, I never get kicked off; here it’s like an hourly thing,” said Laura Kaplan, a student and Resident Assistant at Champagnat. Champagnat Hall during Golden Hour. Taken with a Canon 550D by Luis Alicea. The issue is not something unique to the Marist College campus. Online technology magazine PCWorld reported in 2007 that the same issue had occurred at Morrisville State College in Morrisville, New York. The college did not seem to have any immediate fix for the problem, especially with the Xbox 360 having had a large increase of sales in 2007. None of the Marist College support departments have made any official announcement regarding these Wi-Fi bottlenecks and it seemed that none of the employees had much that could be said in regard to what can be done about the issue on campus. When asked about any statements regarding an official announcement to the students at Champagnat, Kaplan stated she hadn’t heard anything, but had definitely felt the difference in Wi-Fi strength at Champagnat. 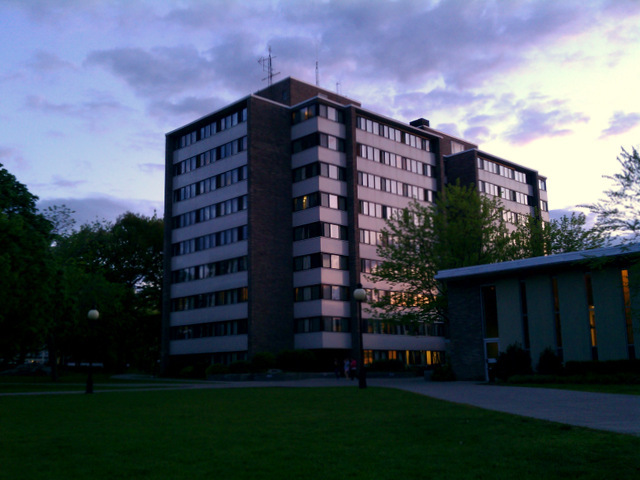 Champagnat Hall is the tallest building on the Marist College campus, with nine floors, and houses over 400 students. The issue may be happening as well in other parts of the campus, but there is no way to know if it it’s the Xbox 360s issue until we have official word from Marist College. It’s winter; while most people are normally out in heavy coats, wearing gloves and scarves to protect them from the low temperatures, others are starting to feel a slight chill and decide to wear shirts indoors. An example of one of these places is Puerto Rico. Puerto Rico, normally known to be a magical island whose weather is “perpetual summer”, is feeling the effects of winter now. While it may not be anywhere as cold as in the continental United States, it is a noticeable decline in temperature to the island’s inhabitants. “It’s been cold lately; we’ve felt wind chills at night reaching the high 60°s F,” said Jesús Montañez of Carolina, who lives up in the mountains of Puerto Rico, “but it’s nowhere as cold as in the peaks in other parts of the island.” The average weather around this time of year for Carolina is around the mid- to low- 70°sF, making the temperature slightly lower than usual. This is noticeable for people in a country whose ‘wear-a-jacket’ days are around the mid-70°sF, and those rarely happen. 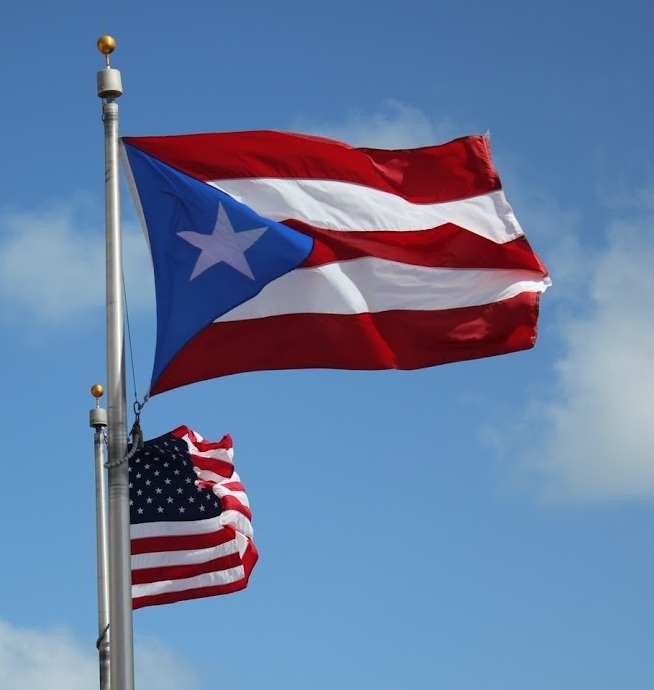 Puerto Rican and United States flags with clear skies behind in December. San Juan, Puerto Rico. While many states in North America have been worrying about winter not coming yet, the residents of Puerto Rico want winter to go away, since it feels out of place on the tropical island. No matter what the temperature is or which season they’re in, you can bet you’ll see the beaches in San Juan filled of both residents and tourists enjoying the winter, showing that no matter what, Puerto Rico will always have perpetual summer.